For the first time in paperback, the culminating novel of Hugo and Nebula Award-winner Jo Walton's stunning Small Change trilogy. 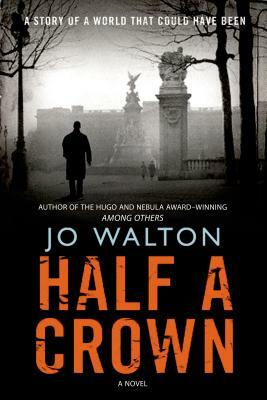 Following the award-winning "Farthing" and its sequel" Ha'penny," "Half a Crown" is an amazing alternate-world noir tale of resistance to encroaching fascism, from the author of "Among Others." In 1941 the European war ended in the Farthing Peace, a rapprochement between Britain and Nazi Germany. The balls and banquets of Britain's upper class never faltered, while British ships ferried "undesirables" across the Channel to board the cattle cars headed east. Peter Carmichael is commander of the Watch, Britain's distinctly British secret police. It's his job to warn the Prime Minister of treason, to arrest plotters, to discover Jews. The midnight knock of a Watchman is the most dreaded sound in the realm. Now, in 1960, a global peace conference is convening in London, where Britain, Germany, and Japan will oversee the final partition of the world. Hitler is once again on British soil. So is the long-exiled Duke of Windsor--and the rising gangs of "British Power" streetfighters, who consider the Government "soft," may be the former king's bid to stage a coup d'etat. Amidst all this, two of the most unlikely persons in the realm will join forces to oppose the fascists: a debutante whose greatest worry until now has been where to find the right string of pearls, and the Watch Commander himself. "A literary Guernica--a top-notch thriller set in a terrified Britain that is all too willing to trade freedom for security, and which gets neither." --Cory Doctorow on "Ha'penny"